Anya boutique is a premium women and kid's clothing store in R.S Puram & Gandhipuram with latest collections for Bridal Sarees, Designers Sarees, Wedding Silk Sarees, Half Sarees, Cotton Sarees, Lehengas, Wedding Designer Sarees, Ethnic Wear and Western Wear for Kids and Women. Buy Latest Fashion Sarees, Salwar Kameez, Sherwani Collections Online in Coimbatore, Chennai. 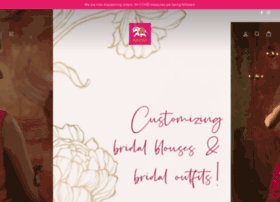 Anya Also Specialises in Bridal blouses and Wedding Designer Blouses.